Sorry for no post last night. I did something crazy. I signed up for Crossfit. My first class was last night. Let's just say that by the time I got home last night, I laid down and didn't get up. I could barely move. Today isn't much better. LOL I got back tomorrow night, we shall see how I fare then. 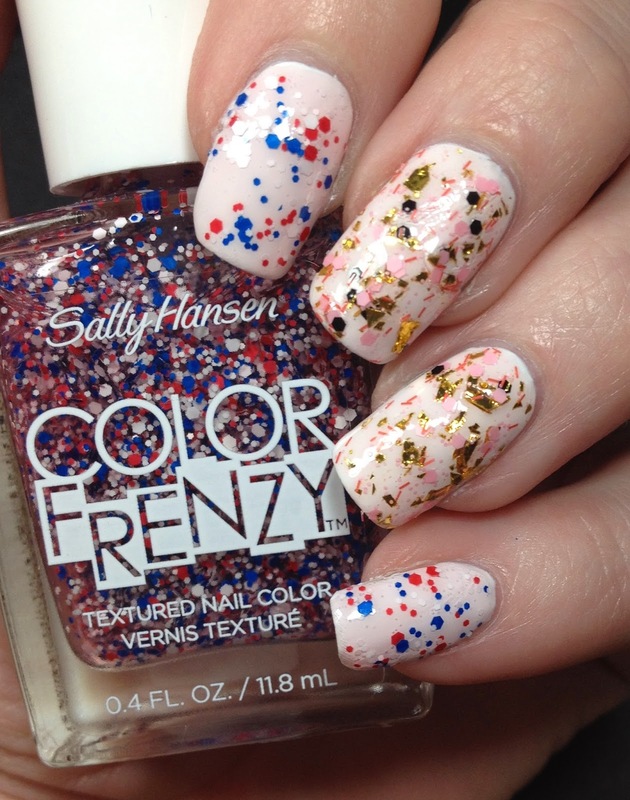 Today I have the first half of the Color Frenzy collection from Sally Hansen. 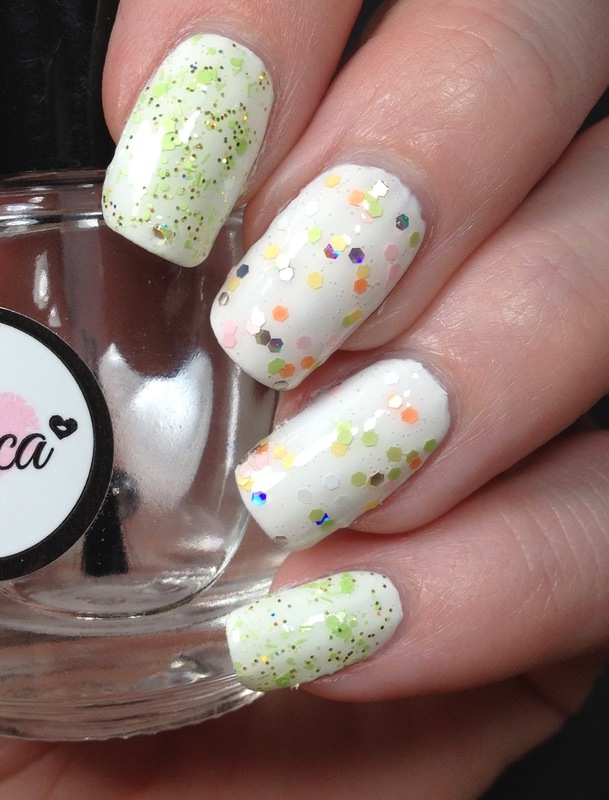 There are 8 polishes in total and they are all glitter toppers. 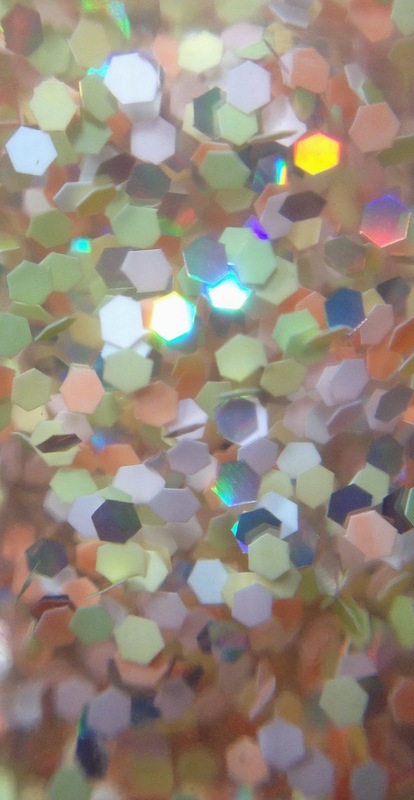 The bottle says texture nail color, but none of them are actually textured (that I found anyway). 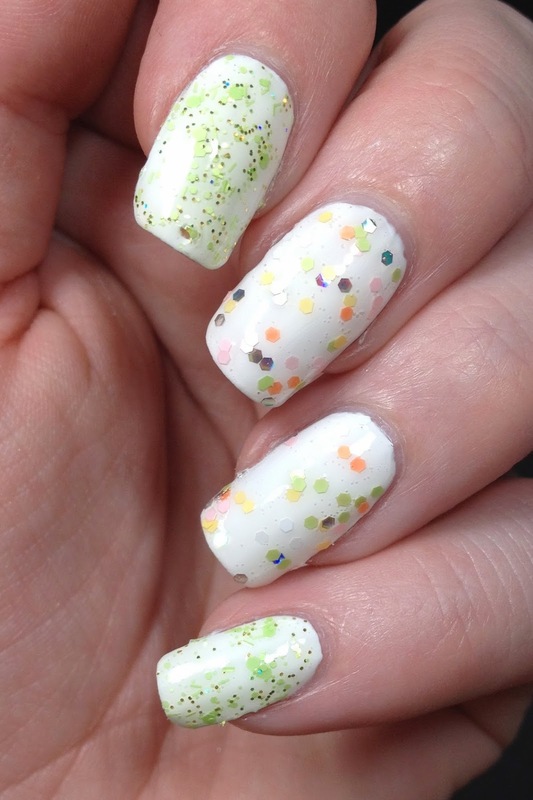 I did not use a top coat on any of them. 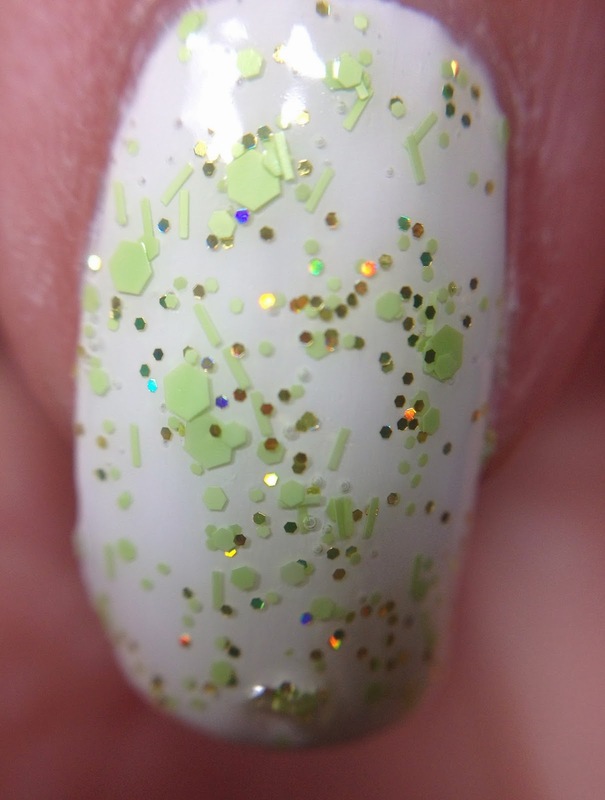 I have put all over these over white you can see the actual color of the polish and whether or not it will alter your base color. I have split this up into two posts because I have quite a few picture for each pair and I didn't want to bombard everyone with a ton of pictures. 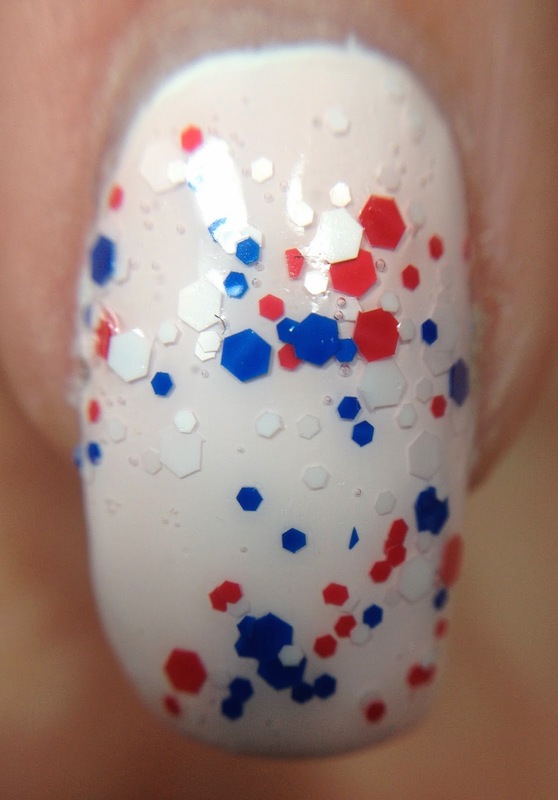 The first duo I have is Red, White & Hue and Splattered. 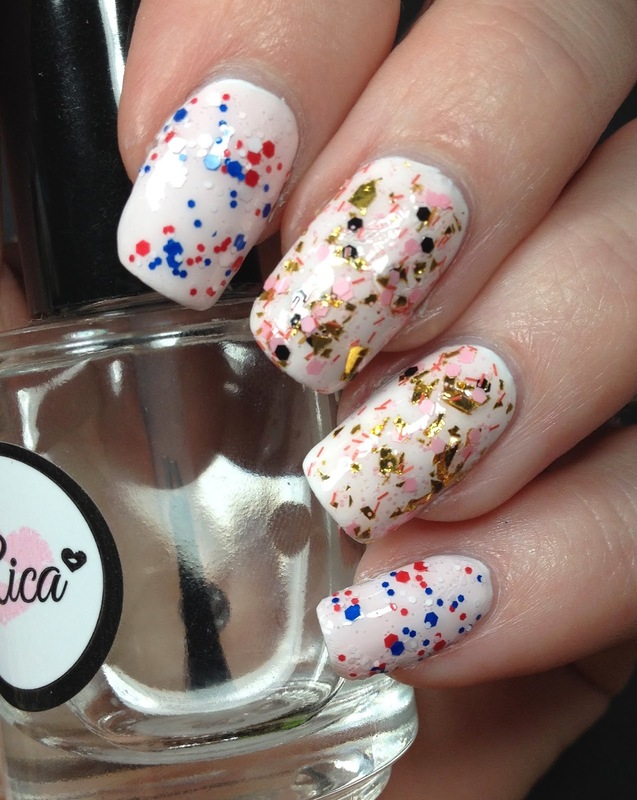 I have Red, White & Hue on index and pinkie nails and Splattered on middle and ring nails. 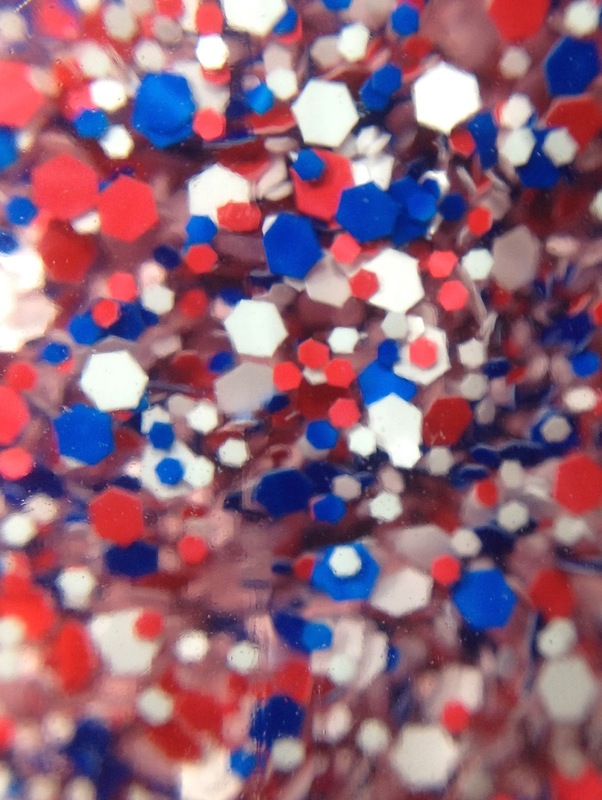 Red, White & Hue is a blend of red white and blue hex glitters in multiple sizes. This wasn't too bad to get out of the bottle. Just swirled the brush around and generally got a lot on the brush. 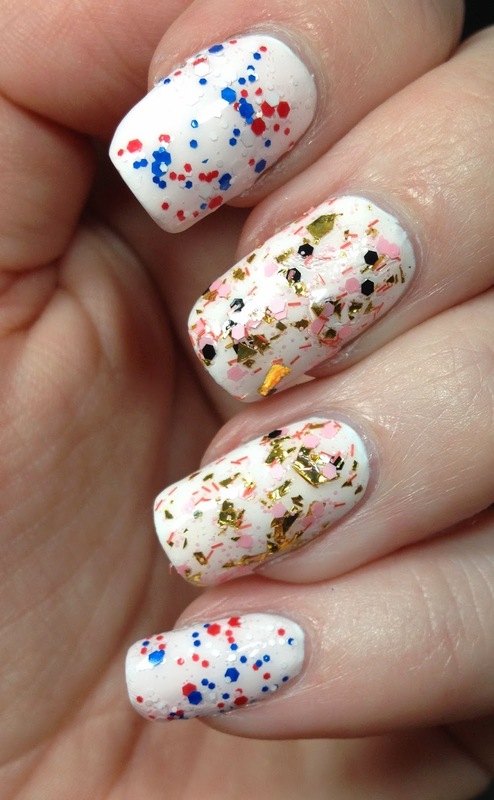 Splattered is packed full of gold shards, red bar glitter, and pink hexes in a couple sizes. 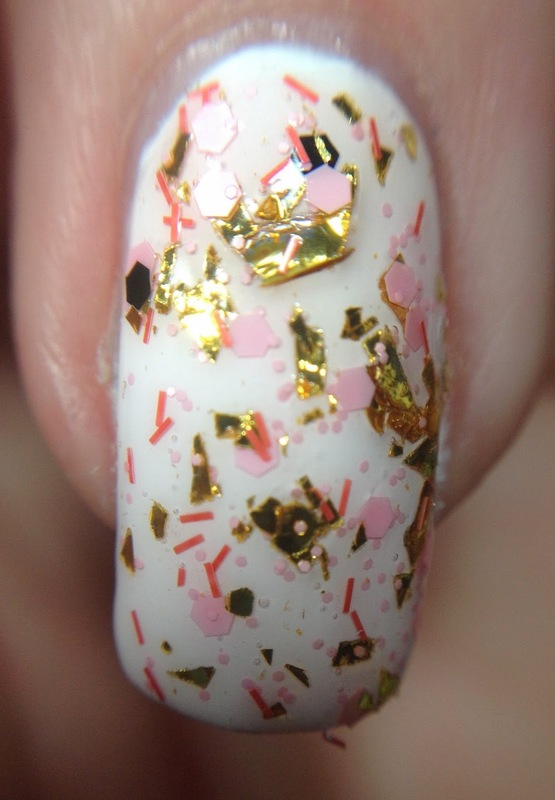 This one is packed with glitter, no issues with this one. I used two coats of each one. I think that Splattered is my favorite one out of all of them. You can see that Red, White & Hue has a smidgen of a pink tint to it. Nothing that is drastic, but it's there. I am not a big fan of the red bar glitters in Splattered but they aren't really that noticeable. I just didn't think they blended in. There was a wee bit of bubbling going on, but nothing that was too bad. The next duo is Green Machine and Fruit Spritz. I have Green Machine on index and pinky and Fruit Spritz on middle and ring. 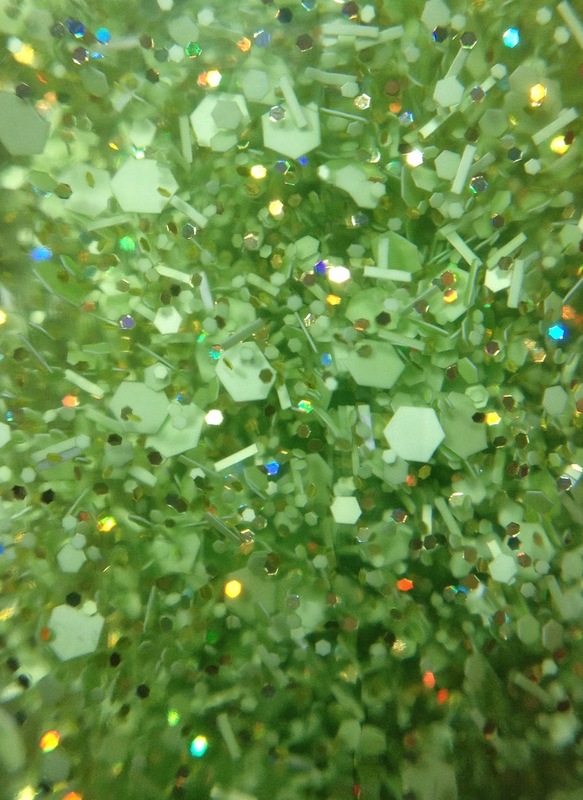 Green Machine is lime green bar glitter and hexes in multiple sizes with some holographic glitter thrown in there. 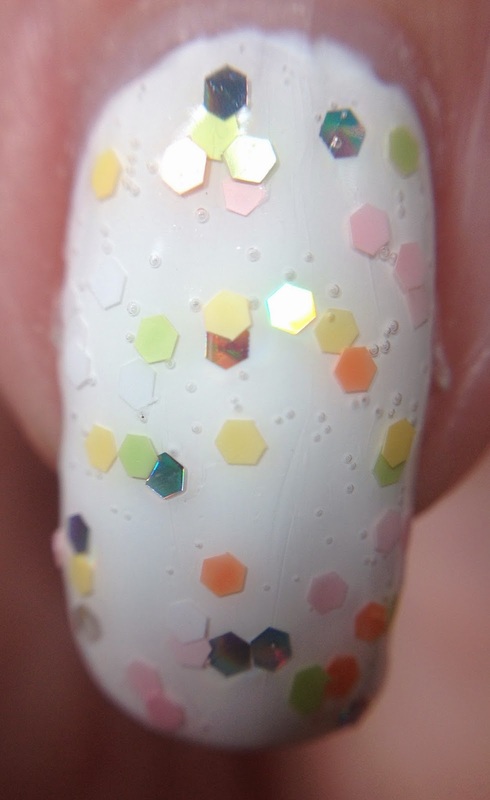 Fruit Spritz is pastel and holo hex glitter. I used two coats here as well. Green Machine was easy to get out of the bottle and went on with ease. I cannot say the same for Fruit Spritz. It wasn't awful, but I had to work at it. I mean, as you can see, I got a fair amount out in my two coats. I liked them a lot. I love seeing mainstream brands trying to capture the indie spirit. Nothing will replace indie polishes, but it's nice to see companies noticing them. Check out your local retailer to get yours! I love the color combos they came up with but the bubbling drives me nuts. Nice swatches of these! 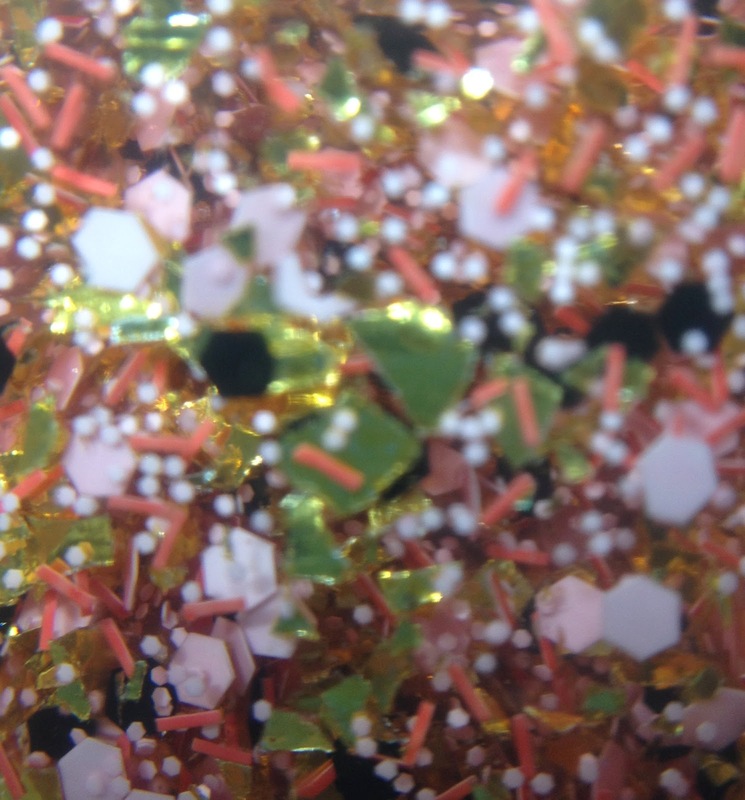 There pretty fun glitters.